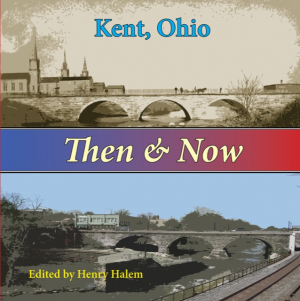 Then & Now is a wonderful book filled with archival photos of Kent dating back to the 19th century. Those photos are compared with full color photos from today. The reader gets to see the profound changes that Kent has undergone. See the Mill, the way it was in 1890 and compare it to the way it looks today. See views of South River Street when it was a dirt road travelled by horse and buggy compared to today. North Water Street in its heyday in the early 70s and what that same strip looks like now. What did Ray's place look like long before it was Ray's. There is so much more. Oh yes there's full color panorama of our city taken from the roof of the old hotel and compared with its b&w twin taken in 1927. Order your copy today.